Thousands of bricks from the old hospital buildings are cleaned. The reconstruction of the Basin at Over coincided with the demolition of the Over hospital that had stood nearby in readiness for a new housing development. Materials from the demolition were recycled by the Trust. 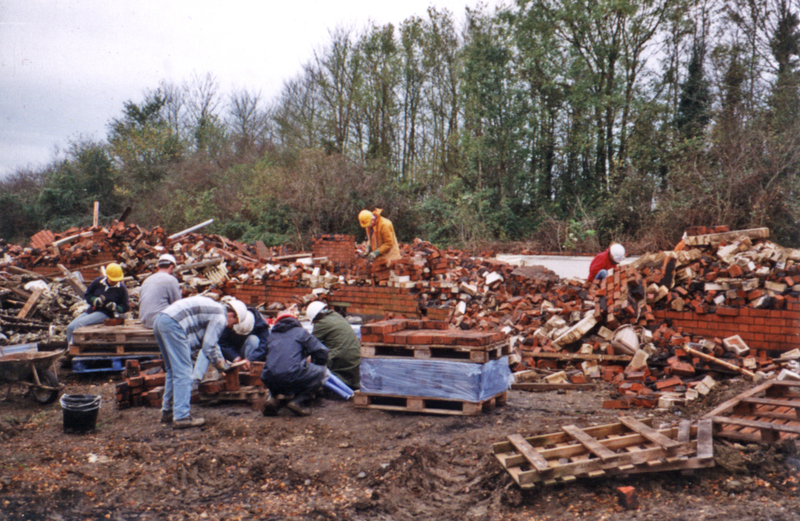 This included thousands of heavy Victorian bricks that went into the building of the wharf walls. The brick had to be picked from piles of rubble, sorted and the black mortar chiselled off of the surfaces ready for them to be relaid. The volunteers were also able to make good use of the wood blocks from the hospital to lay the ground floor of The Wharf House. The skirtings and doors were also recycled and using within The Wharf House. The bricks forming the three arches dividing the Visitor Centre from the Restaurant are recycled from the old lock cottage that once stood on the site. The bridge over the old lock is half of an old army Bailey Bridge. The other half being used at the Oxenhall site before the aqueduct was restored. The recently bult overflow weir is made of old concrete railway sleepers and recycle bricks, as is the abstraction channel and service huts. Even the car park at is built with recycled materials; the surface is old road planings, the larger trees were moved from an abandoned nursery, old wooden and concrete railway sleepers are used for retaining banks and edging the parking bays. All the dry stone walls are recycled from stone found around the site and carefully saved. Nothing is thrown away if it can be recycled. Water is not exception! Storm water from the hard surfaces around the nearby housing development is fed directly into the basin. If there is a dry patch and the level of water goes down water is pumped from the River Leadon alongside the basin so it is used just that bit longer before flowing into the River Severn. There is still an amount of reclaimed materials at Over waiting to be used. Most of these will be used in the reconstruction of an old barn that used to stand elsewhere on the site.